Bilfinger Industrier is a leading provider of insulation, scaffolding, surface protection, passive fire protection, access technology, habitats, interior outfitting and related engineering products and services. Bilfinger’s Lambda product range includes prefabricated solutions for fire, acoustic, cryogenic and thermal protection, which have been tested and developed to meet the NORSOK requirements. Lambda is the brand name of prefabricated insulation products made by Bilfinger Industrier. All products are designed, tested and documented to be used in high-risk environments, meeting NORSOK standards. Bilfinger Lambda products are designed for quick and easy removal and re-installation using minimum personnel, personal protection equipment and tools. The Lambda ‘F’ products have been tested and certified to withstand hydrocarbon and jet fire with temperatures ranging from 250kW/m² to 350kW/m² (IMO 2010 FTP Code Part 3, ISO 22899-Part 1 and Extended OTI 95634). The Bilfinger Lambda ‘F’ jet fire boxes are completely maintenance-free, which reduces the overall total operation cost compared with similar products. The ultra-slim design is also featured in the Bilfinger Lambda ‘F’ pipe product, which is an innovative solution for insulating pipes in confined spaces. It has been tested and certified by DNV-GL. The products are fully tested with inspection hatches and drain plugs, and include extensive documentation such as mass, surface area and operating temperature. The hydrophobic materials effectively reduce corrosion under insulation. The Lambda ‘F’ pipe penetration seal (PPS) is a patented, customisable and flexible insulation system designed as a fire and gas seal for bulkheads and decks. It is fully certified by DNV for Classes A0, H0, A60 and H60 and tested for jet fire with a heat load of up to 250kW/m² (ISO 22899-Part 1). The Lambda PPS is a flexible, easy-to-install solution that facilitates pipe inspection and maintenance. The Lambda ‘F’ BoltCare is a flexible jacket designed for fire protection for flanges and bolts, where the pipe itself does not require insulation. The BoltCare jacket is tested for jet fire with a heat load of 350kW/m² (OTI 95634) and extreme weather. This is an advanced and flexible product regarding flange inspection and maintenance. The Lambda ‘A’ sound-reduction solution consists of both curtains and an installation system. The acoustic insulation can also be applied as flexible jackets for valves, flanges, pumps or other equipment. Noise levels are reduced by up to 20dB in high-frequency environments and the solution is tested and approved in accordance to NORSOK Classes 6 and 7. The Lambda Cryo Box is a prefabricated cryogenic insulation system that is designed and tested to insulate valves and flanges with operating temperatures down to -163°C / -261°F. The solution can be removed and reinstalled multiple times, which means significant cost savings. The Lambda Cryo Box is customised and assembled at Bilfinger’s workshop and its installation requires no heavy work or hot work onsite, resulting in the involvement of fewer personnel, a more efficient installation and a safer working environment. The solution applies to NORSOK Classes 2, 4 and 9, and is also available in combination with Lambda fire box or jacket for equipment requiring Class 5 insulation. The Lambda multipurpose thermal insulation jacket is used as both thermal, sound and personnel protection for NORSOK Class 1, 4 and 6 applications. The solution can be used in various production environments such as power plants, process, marine, and oil and gas industries. 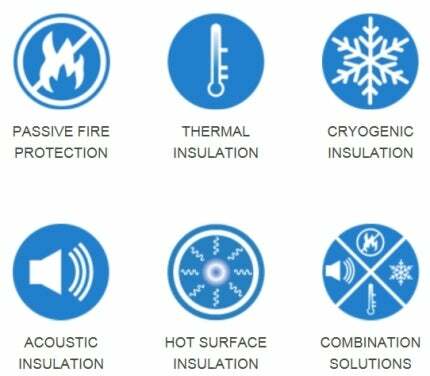 Bilfinger’s customisable thermal insulation system can be delivered as flexible jackets or boxes in stainless-steel. Its insulation material and thickness can vary, depending on the client’s requirements. All seams are sewn with Kevlar thread and sealed with silicone, which prevents leakage. Lambda has accumulated experience with combination solutions, as a result of more complex requirements involving insulation for several NORSOK classes or other standards for equipment. The challenge with combination solutions is often related to meeting all requirements, while keeping the insulation thickness at a minimum. Bilfinger Industrier is based in Stavanger, Norway. The company has 1,700 skilled employees working across Norway and Denmark. It holds ISO:9001, ISO:140001 and OHSAS 18001 certification and is listed with Achilles JQS. Bilfinger Industrier is the largest of four business units within the oil and gas division of Bilfinger SE, a major international engineering and services company.